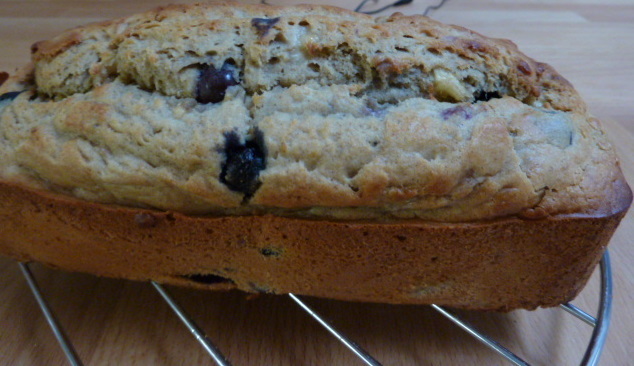 I’ve had a few requests for the recipe for my Banana and Blueberry cake so I’m posting it here. Just a few things to note: as I make it, the cake contains no added sugar, I use Splenda™. This is an artificial sweetener that you can use measure for measure like sugar. So if you prefer sugar just substitute the same quantity. Also you can make this cake using sultanas instead of blueberries if you prefer. I also used Flora ProActiv, a cholesterol lowering margarine but you can use any margarine or butter if you prefer. 1/2 tsp vanilla bean paste. Place the dry ingredients (flour, Splenda™, cinnamon in a bowl and mix well. In another bowl add the melted margarine, then the vanilla paste, then the milk and finally the eggs and mix well. Add the frozen blueberries to the dry ingredients and mix so they are coated. Make a well in the centre and add the mashed banana and then add the wet ingredients to the bananas, stirring all the time. When these are mixed, gently stir the well mixture so that it picks up the dry ingredients and incorporates them into the mix. Do not over mix or the cake will become tough. Mix it just enough so that it is thoroughly mixed and no more. Grease a silicon loaf tin and pour the mixture into it. Cook in the middle of a fan-forced oven for 40 – 45 minutes at 180deg C. The cake is cooked when a skewer placed in the thickest part comes out dry. Let the cake stand for 2 or 3 minutes once you take it out of the oven then loosen the sides with a knife and turn out onto a cooling tray. I hope you enjoy it. I like it sliced with a bit of margarine or butter on it. Sounds delicious. Right now I can buy fresh blueberries in the grocery store so will use them. And I always have bananas in the house.